that just might frighten my readers. Some creatures just ran out of luck when it came to the cuteness DNA gene. Take for example the Sloth or the Blobfish. I guess if you are going to put things in perspective, the Blobfish is clearly the winner of the least likely to get invited to a prom award. Clearly there is at least one creature for everyone or we wouldn’t have the ability to even view such oddities. It should be noted in a desperate attempt to pretty up this featured duck, I officially rolled out my new signature logo. Big thanks to my brother Ron for putting in the elbow grease to bring my scribble into an electronic stamp. He had made one for himself that looked awesome and offered to process one for me as well – that offer was definitely accepted. Of course, deciding to do it was the easy part, writing my name 400 times until I felt comfortable with it took me back to grade school and having to write lines as class punishments. Key was it had to resemble the main elements in my sig and had to be familiar enough that it was reproducible in the field. Check and check. I am still playing with the size ratio to the image, but really, really happy with the end product – big thanks again to Ron! I should probably get back to the featured creature for this post – especially since there is a good chance you might opt to jump to a more eye pleasing post. 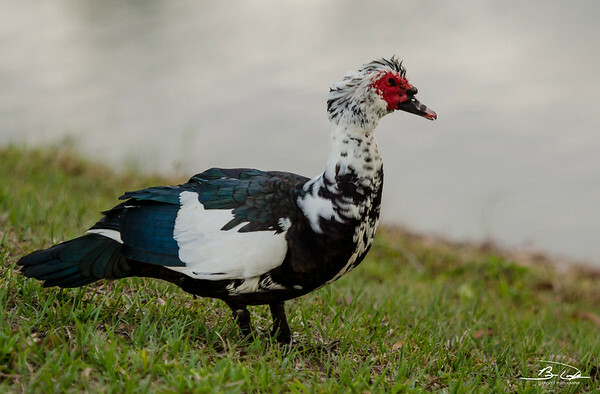 So this ugly duckling of sorts is called a Muscovy Duck. It happens to also represent a new +1 in my North American Birding List. 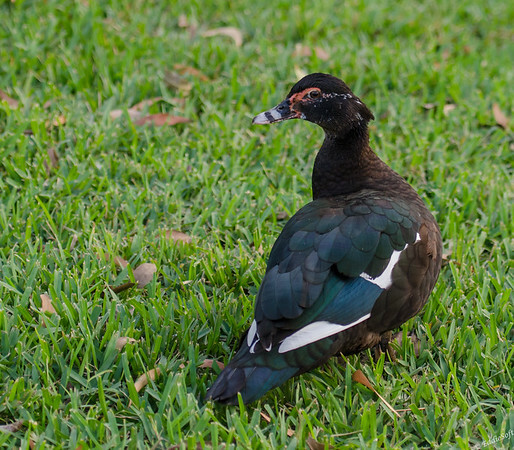 This particular set of ducks was shot in Ft Myers in March 2014 while on a quick trip down there on a family task. Again, I have to thank Ron for alerting me to the presence of this bird. He was there on an earlier trip and added this duck to his list. After days and days of searching high and low for interesting birds, he ended up finding a group of them at an extremely exotic location. (If you read my last post, Kenn Kaufman is probably cringing about now). Knowing that Ron found these ducks at that location, I grabbed my camera on the way out the door with one single purpose. After the quick flight down, I had my Dad take a short detour on the way back to his condo – that’s right, straight to the exotic Steak ‘N Shake. Sure enough, there they were. The duck below was hanging out in the drive thru and the others were scattered about the parking lot and others near the pond. Guessing the customers seated along the windows were trying to figure out what I was doing out there. The things birders are willing to do to increment their count. Getting low on shots, so better get to some interesting facts. That means a quick jump over to our friends over at Cornell to see what they have to offer. 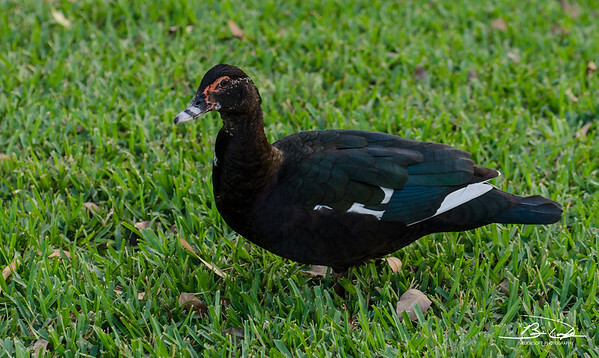 As far as North America goes, these ducks are really restricted to the South Texas region when it comes to the wild variety. Clearly I was not in Texas, but the site does comment that there is a self-sustaining feral population in Florida. They are one of the oldest domesticated ducks in the world and the drakes are considered the largest ducks in North America. I can attest to that from my personal experience – these ducks are huge. Guessing this a direct example of evolution. Their early brethren had sand kicked in their face by preppy Mallards. To defend themselves, these bully victims were forced to work out day and night, pounding protein bars and mega-carb loading in an effort to hold their ground. 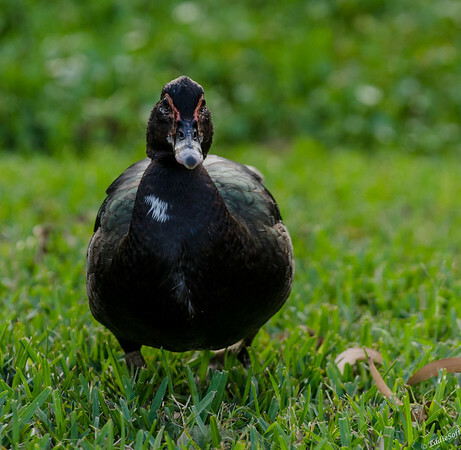 As the generations went by, the protein was growing their frames to a point where double Polo wearing Mallards don’t even attempt digging their webbed feet in the sand around them. Ah, Cornell does answer the naming question. 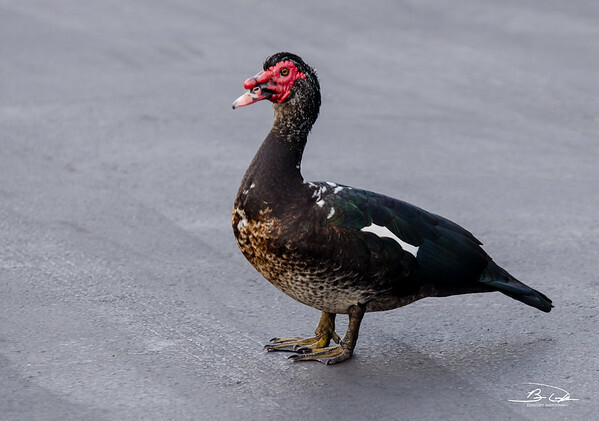 The word “Muscovy” likely references the London company which brought these ducks to England and France in the 1555 time frame. They are also known for their powerful claws which are very evident in some of these shots. 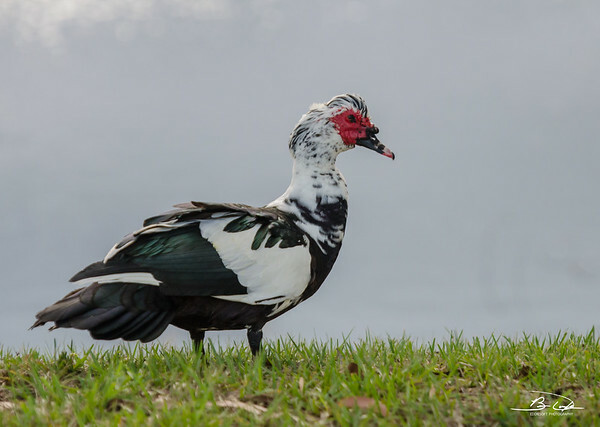 Like Wood Ducks, the Muscovy prefer to perch in trees – likely a tribute to their early pioneers that had to find safety from the bullies by seeking higher ground. Seems I am officially out of pictures. Hope you enjoyed seeing these rather ugly webbed footed creatures. If nothing else, you got to see my new sleek signature (ha). Take it easy everyone, see you again real soon. Yes, very ugly birds! 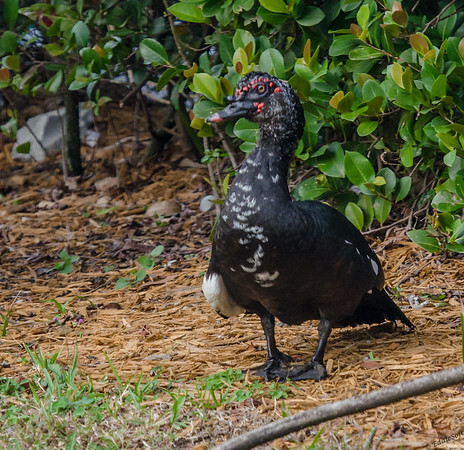 I think I may have pics of uglier Muscovy ducks that you, actually. But after a while you get to appreciate their variety, and they seem pretty tame and quite social, with pairs of them herding little ones in creeks and ponds. Which is good since you say they have powerful claws. I actually first got pics of these in a creek and only later saw them at Steak ‘n Shake. I kind of got to like these ducks. I always thought “Muscovy” somehow was a derivative of “Moscow”, but maybe that’s how that company, or the company’s founder, got its name. Thanks for the pictures! At least this time it was a bird already on my life list–those ones from out west usually make me wish I was out there birding. As always, thanks for commenting! Hey, I just thought of something. You know that muscovite (also known as common mica, isinglass, or potash mica) is a phyllosilicate mineral of aluminium and potassium with formula KAl2(AlSi3O10)(F,OH)2, or (KF)2(Al2O3)3(SiO2)6(H2O). Well,I just remembered that the name muscovite comes from Muscovy-glass, a name given to the mineral in Elizabethan England due to its use in medieval Russia as a cheaper alternative to glass in windows. 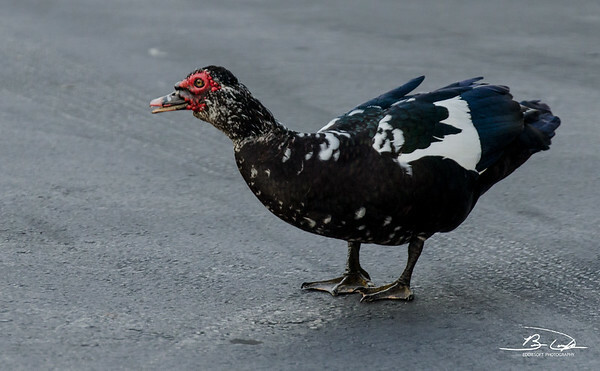 So there may be some truth to Muscovy Ducks getting their name from Russia. I don’t know why I didn’t think of that. You must not recall how much I sucked at chemistry (but I do recognize that it contains water. A very intriguing relationship and it seems like a logical conclusion. 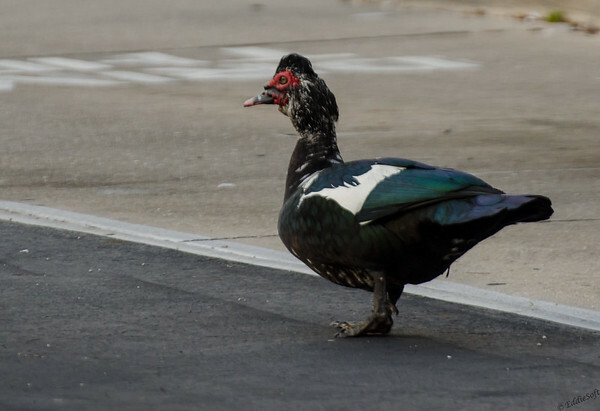 Can we conclude that Muscovy Ducks hacking into the DNC is in fact a viable explanation? Great pictures – ugly birds. Maybe you could get some prettier ones. There are definitely prettier birds both in Ft Myers and other places I’ve been since then. I am slowly processing those and hope to get them posted soon. The good news is no matter which bird I post now, it has to be prettier than these – ha!